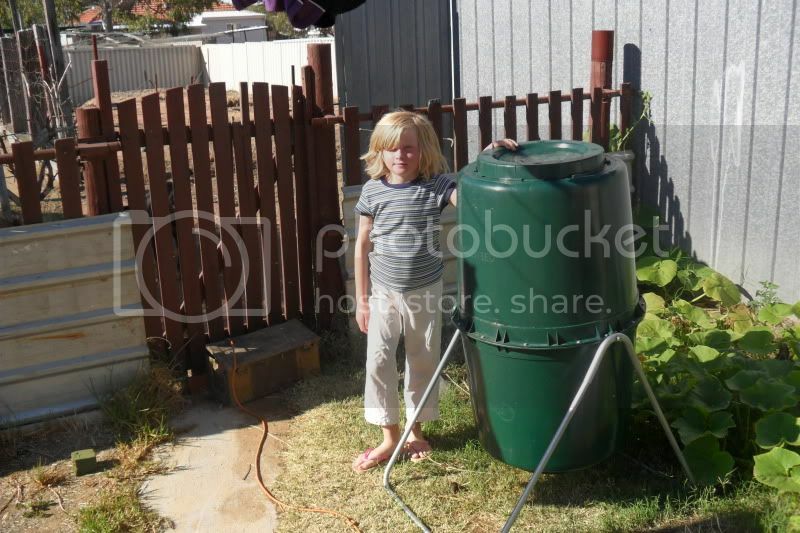 got my first compost tumbler yesterday, working away so much i had to find another angle to help keep my 9 year old daughter keen on putting stuff in compost bin. 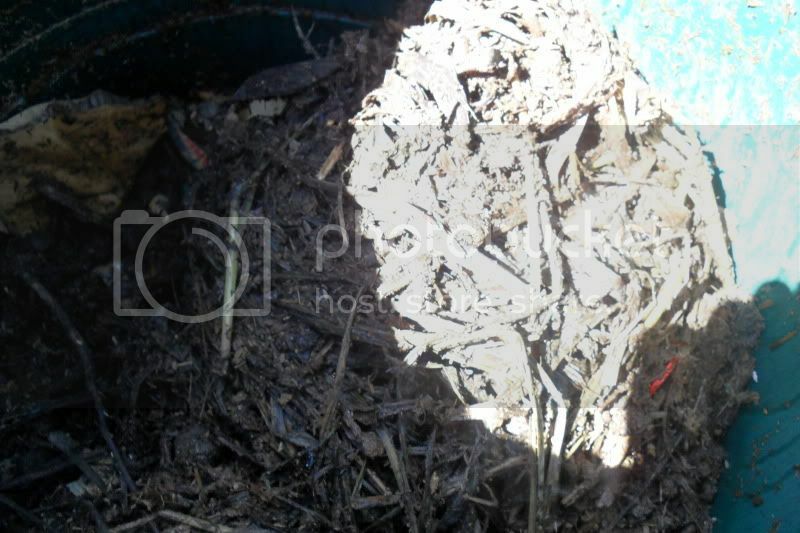 i heard all sorts of wonderful claims that it makes compost in a fortnight, which i find hard to believe, what has your experience's been with them? any tips? I haven't used one. I have friends who have them, but I don't think they're getting compost that quickly. It might depend on what you put in. I think my friends were putting in kitchen scraps, but no brown material. Personally, I just use an open heap, but I am keen to read comments by others using these to find out if they're worth the cost. 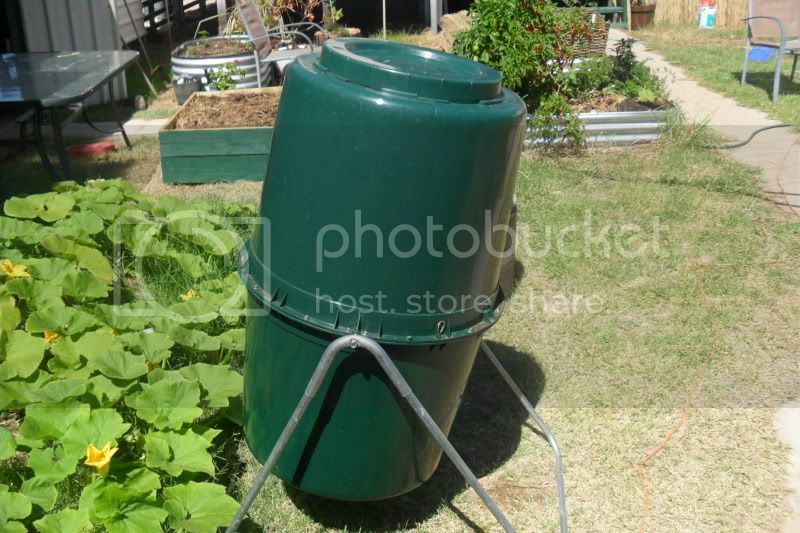 i got mine yesterday for $199, i been using a open air compost bin for past 20 years, just had some spare cash and thought worth giving a tumbleweed a try. We were getting compost in around a fortnight when we had ours. The 'new improved' version has been in the pipeline for the past couple of years now. cool, yes with this place the chickens produce heaps of poo, now got a horse stud that is delivering monthly 2 or close to 2 tonnes of horse poo. carport is now full of horse crap, wife not impressed with me today, but carport is right next to vegie garden, only 3 metres from it. want to covert 100sqm of lawn to a productive vegie garden/ orchard. we on clay so with no shortage of manure all i need now is a constant supply of compost. Hi Jack, sorry mate, never had one but will be following this thread with interest. - maybe suggest horse douvres for dinner? Pam - had one? What happened to it? we lucky, colin should be familar with our house design, a typical 1960s fibrecement home with asbestos roof, built right throughout country w.a back then. our carport is 30 metres down the drive and a metre past the rear of the home, beyond it is a garage and then close to 15 metres more land till back fence. We moved and had too much 'stuff,' so from memory I think we freecycled it. Ahhh! Yes, been there done that Pam. It's amazing how much stuff you collect. I have a 400 lt compost tumbler , and if done correctly you can get a nice load of compost in 2 weeks ..
plenty of grass clippings , some fresh shredded prunings , collected kitchen scraps , chooky poo etc ..
turned at least twice a day .. heat generated was amazing ..
bil & sister had a bank of home made 200 l ones to compost collected race horse manure ..
growth on beds on that block was amazing . when its not raining , its dripping off the trees ! Never had one but keen to get one. For me, any extra speed in producing compost would be a bonus...i mainly want one so i can make specific mixes for specific projects/plants. At the moment i have two of the bottomless bins that sit over holes i dig to basically trench compost a few areas i'm turning into garden beds, and absolutely everything goes in them. However, in the future i may want to make some compost that is, for arguments sake, say 1 part grass clippings, 1 part chook poo, 1 part lucerne and 1 part banana skins! Then i can just shove all the ingredients in a tumbler and know it hasn't been contaminated with weeds, pre-existing soil etc, and it will be very easy to mix with no back braking shovel etc. You can even get some that you can push over and the tumbler acts like a big wheel and you can just push it to where you want it. i got the tumbler,, its great, working well so far and this is its first week, is really hot and cooking well. I have had one for over 2 years now and I think they are the best investment in the garden I have made. I would say 2 weeks is a bit of stretch. 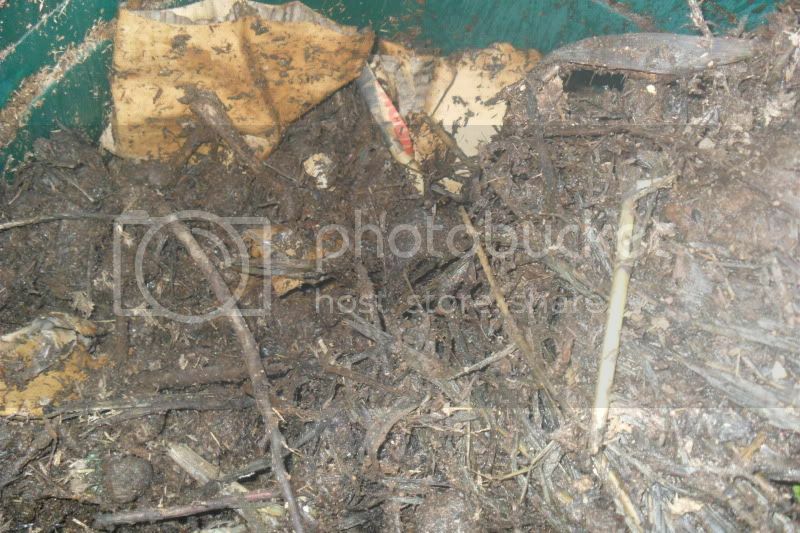 There is a diff between materials breaking down and decomposing and what I'd call compost. I'm never in a rush to have the compost but I'd say 4 weeks min but 6 weeks pref. Longer in winter. The only drawback with the tumbler process is it really works best adding a batch of materials all at the same time. Adding new materials half way through the process is not really advisable. Also it needs to be 3/4 full to really generate sufficient heat, so don't buy a large capacity model if you are only going to be able to half fill it. My other suggestion would be to "dry out" grass clippings for a few days before adding them. Else they tend to come out a little gluggy mess out the other end. It is critical to turn at least once a day and don't expect some items like egg shells or corn cobs to fully break down. They don't, but the process has been much accelerated in the tumbler. No issues with birds or attracting vermin. And best of all you will hopefully enrich your soil without needing to bring in expensive soils that tend to be a source of pathogens and disease. Thoroughly recommend them--far better than your traditional compost heaps or compost bins. almost two weeks gone by now, bin is just under half full seems i add stuff and it settles quickly back to the half way mark, it is getting some composting happening, little dark soil collection on lids etc, a lot more than any other means, so can see it is working but expect at least another few weeks to get anything i can use, am putting the weekly clean up of the chook pen in it, ie a little bit of straw, a little manure and a lot of feathers, this is filling half a ikea bag. i also now have child putting in every bit of paper/card that goes through the home, plus horse manure, stable straw and chaff has gone into it. only problem i have found so far was a terrible accident yesterday, daughter age 9 tried to turn it and it knocked her flying back into the corrugate iron fence, one very nasty cut arm and tears galore, has her now not wanting to tumble it. i did find in the don burke organic book a guide to a home made tumbler, which i might try if this one gets full. only vermin i found so far was maggots on the edge of the lid, in some manure that i missed getting into bin, ie on the out side of bin but inside the bin it was way too hot, so far not found a single bug that can live in their. Jack - looking at the photo, I get the impression you'd struggle put the lid on if you fill it past the half way mark (or without the material falling out). Is there a design feature that you can't see which allows you to fill it to capacity? Maybe it's just me, I assumed you open it from the middle, but surely you must have a hatch at the ends??? How's your daughter? Still traumatised? it has a lid on each end, top/bottom. i would guess is now weight wise a lot more than my child, she ok, today has decided will only rock the tumbler which she finding fun, a bit of a shock last night she did not expect it to fling her, ie she was smart, decided she reckons to turn it by putting her whole body on it. lesson learned from that. just dragged daughter down to the bin, which is now a good metre or more further from fence than yesterday. you can see the problem, large bin, thin child, good projectile if she gets in the way.